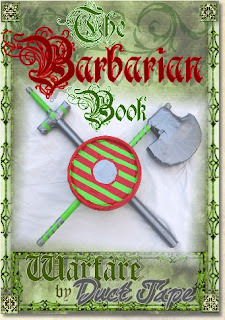 My friend Cheri shared a link with our homeschool group for a free Shield and Throwing Axe book from Warfare by Duct Tape. After looking over the info I thought it would be perfect for a Boy's Club activity. I'm always on the lookout for something for the boys to do. Anything fun, rough, or that gets them dirty is always going to be a big hit with our group, this was no exception they LOVED making the throwing axe and shield. 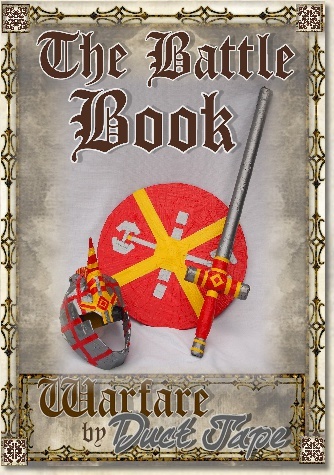 So if you want to re-enact history, defend honor, vanquish the enemy and take dominion... or just plain have fun then check out Warfare by Duct Tape! We had a battle in the front yard. Some shields were plain, some had crosses and other embellishments but all were well loved! 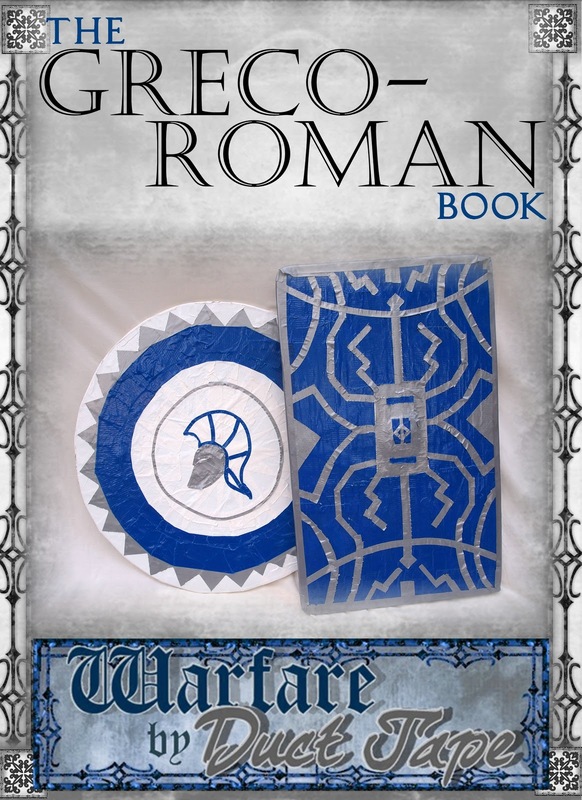 We are studying the Romans this year for homeschool and I found a Greco-Roman book on the Warfare by Duct Tape website...hmmm, wonder what we will be doing in school today? Looks like making Roman weapons from duct tape, it's not going to be a boring day in our school house! At $7.95 per booklet you can help bring ancient history to life with a little bit of work and a lot of imagination. 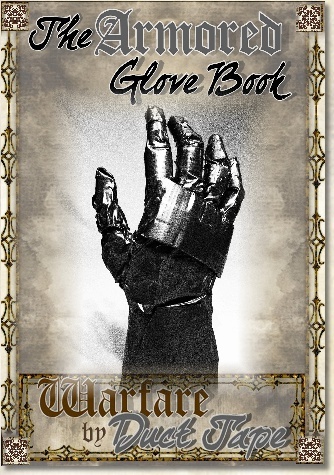 This glove book looks so cool and really looks like armor! 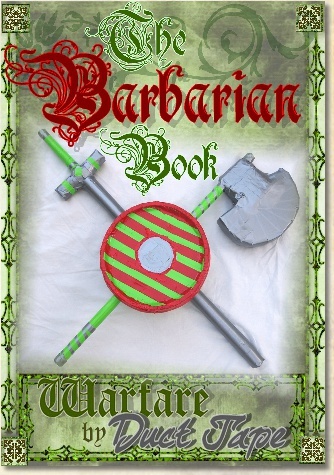 This book has the main sword, shield and battle axe that the boys used. If you have girls that want to make something fun and exciting check out the sister website Jewels by Julia! Wow! That's great! It's so awesome to see boys loving our Warfare by Duct Tape books! Your guys look like they are having a ton of fun. They made some very creative designs, too! Thanks for the very nice post. No problem about using the picture for the post. It helps to get the word out. hi! thanks so much for stopping by my blog and following! I'm a new follower here as well- LOVE your blog design. Hope you're having a great day! Eli loves his, Jennifer. In fact, it has inspired his Halloween costume. He wants me to make him a Captain America shield in the same way. He wants to give his other one to Brynne so they can play together. Funnnnn!!!! This looks like so much fun! Makes me excited for my boys to grow a little older and do fun projects like this together! Thanks for following my blog, I am happy to follow yours too! Wow, it's miracles! The boys did wonderful job, love the books ans also love your blog posts! Thank you very much for creating and sharing! Hi, thanks for stopping by my blog http://babyfeetandpuppybreath.blogspot.com/ I am following you back now. Those are great! Thanks for visiting my blog, now following you! LOVE this idea! Just started homeschooling this year and with two very very active boys this will go over well in our home! Thanks for your visit and kind comments on my blog :) Have a blessed day!! This is awesome! We love duct tape at our house! I think we'll have to make some of these. Stop by and see my zebra duct tape shoes if you get a chance. Cute blog! My boys love duct tape! I'm your newest follower! Thanks for coming to visit our blog. My son would have loved this when he was little. Great idea. I found you on Tips from the Heart for the Home and I am now following you. I hope you will take a moment to stop by my blog and check out my kind of fashion (hair jewelry). I'm not just trying to gain followers with hopping, I'm trying to spread the word about a product I love. Here's my url http://talesfrommyjournal.blogspot.com I also have a facebook page which is www.facebook.com/DeniseMartin.LillaRose I hope you can stop by there as well. It's the fastest way to hear about specials. Let me know if you have a facebook page too so I can return the favor. I see you have a button for facebook. I will go ahead and give you a like now! There's nothing that a little duct tape can't fix or make. We love duct tape in our household. You're children are cute! I would love to adopt some day but we are not in a position to do so. I keep looking to the future for the possibility. Thanks for the follow. I'm following your blog and on pinterest. Hi, Thanks for visiting me. You schooling looks fun!